Georges Braque developed his painting skills while working for his father, a house painter who specialized in decorative and trompe l'oeil effects. Moving to Paris from his family home in Le Havre in 1900, he met artists such as Henri Matisse, André Derain and Raoul Dufy. During the winter of 1906-07, Braque went to the south of France, where he immersed himself with the landscapes of Paul Cézanne and the colors of the Fauves. Shedding the emphasis on bright, disharmonious Fauve color by 1908, Braque became more interested in volume and structure, strongly influenced by Cézanne. He met Pablo Picasso at this time, and together they developed Cubism, a revolution in painting that redefined art in the 20th century. 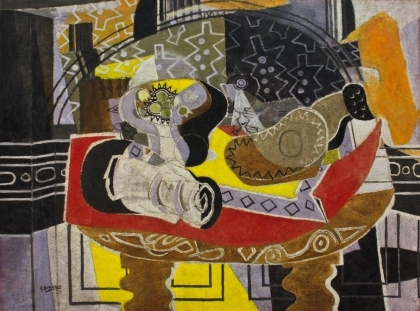 In fact, the term 'Cubism' was applied by a critic to a painting by Braque exhibited in 1909 at the Salon d'Automne. Braque entered the army, went to fight in the First World War, and was wounded. When he returned, he began painting in a new style that reflected Cubism but with a new sense of volumetric form and a distinctive brown-black palette. He followed this basic style for the rest of his life, primarily applied to the tabletop. Towards the end of his life, Braque created a series of monumental paintings based on scenes of his studio.